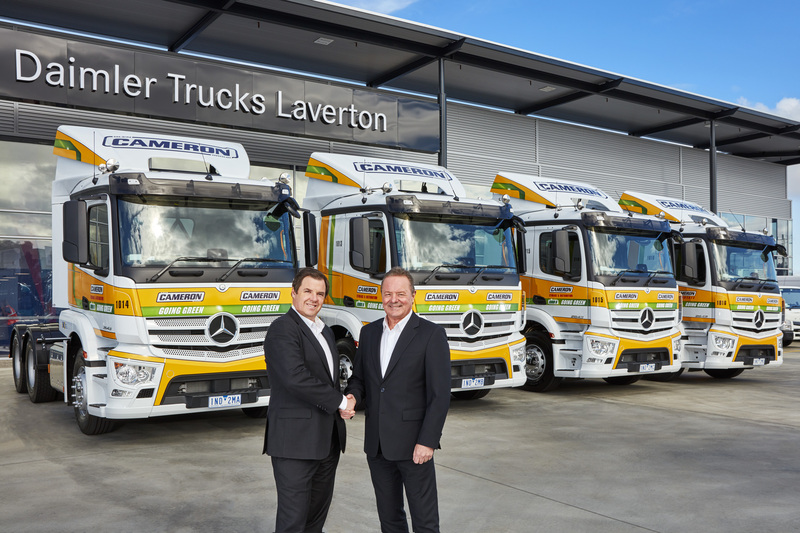 The Glen Cameron Group has ramped up its commitment to reducing its carbon emissions having taken delivery of four new Euro 6 Mercedes- Benz trucks. Daimler Truck & Bus Australia President and CEO, Daniel Whitehead presented the trucks to Glen Cameron at Daimler Trucks Laverton, the manufacturer’s new $30 million facility in Melbourne’s west. Mercedes-Benz Euro 6 trucks reportedly cut particulate matter by 99 per cent and reduce nitrogen oxides by 97 per cent. Savings of more than seven per cent is expected of its fuel economy. Glen Cameron said his company was continually looking for new innovative technologies designed to reduce its carbon footprint. The colour scheme of Glen Cameron trucks is traditionally an iconic yellow and white. A green ribbon, introduced to signal the company’s commitment to the environment, has been added to the new Mercedes-Benz trucks. All vehicles in the range will be fitted with the Mercedes-Benz Safety Pack. “As we progress with our fleet replacement programs and consider that the average Cameron fleet age is only 3.5 years, we expect that within a relatively short period that a substantial part of our fleet will be comprised of Euro 6 vehicles,” said Cameron. Mercedes-Benz is the first Australian manufacturer to launch to market a range of Euro 6 models. The Glen Cameron Group has taken order of the six-cylinder 11-litre models with 430hp. The Euro 6 prime movers are also available with 13-litre engines with up to 530hp and 16-litre engines with 625hp. All trucks in the range will come with the Mercedes-Benz Safety Pack, with technology that prompts automatic emergency braking for pedestrians and vehicles and provides driver alerts for fatigue and lane keeping. Daniel Whitehead said his company and Glen Cameron had a long and rewarding relationship. “Our new generation Mercedes- Benz range has proven that it is possible for Australian operators to use less fuel and less AdBlue while cutting emissions at the same time,” said Whitehead.